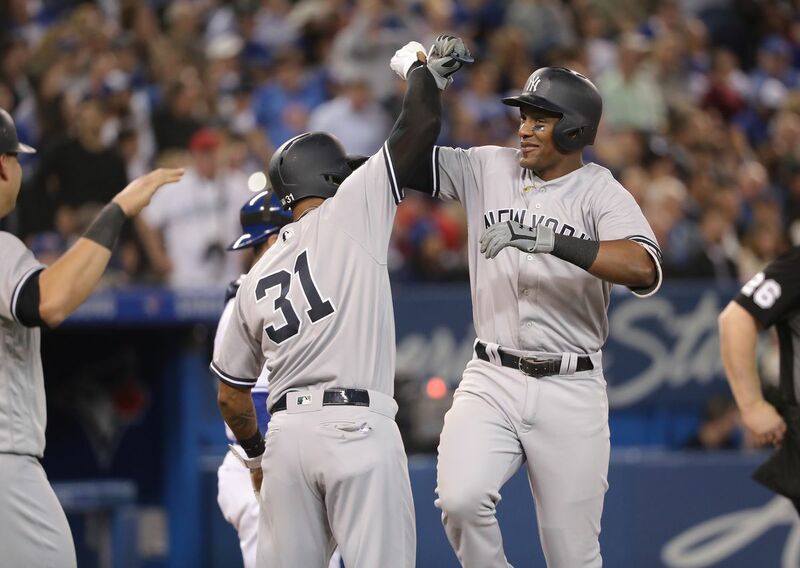 The Yankees returned to Toronto for the first time since the season’s opening series, and pummeled the Blue Jays’ bullpen en route to a 7-2 victory. The game started out slow, but overall turned out to be a solid victory for the Bombers, led by homers from Andujar and Hicks, along with a great start by CC Sabathia. As said before, the game started out slow for the Yanks. They managed to strike for five hits against Marco Estrada in the first six innings of the game, but all five base runners were stranded. Giancarlo Stanton narrowly missed a homer in the first inning with a double off of the right field wall, Greg Bird pounded a double down the right field line, and Andujar, Gardner, and Austin had singles, with each hit in a separate inning. Not much went right against Estrada, who kept the Yanks off balance the entire game with his changeup. The seventh inning was a different story, however. Gary Sanchez led off with a single to center, and Blue Jay manager John Gibbons made the curious decision to replace Estrada with Seunghwan Oh. Estrada did have 97 pitches, but his success so far made the decision very odd. It would come back to backfire in the end, as Oh hit Didi with a pitch, walked Hicks, and then served up Miguel Andujar’s first career grand slam. It was a beauty to watch. The eighth inning didn’t go much better for the Jays; Stanton dunked a single into left, advanced to second on a wild pitch, and then advanced to third on a groundout by Bird. Didi later walked, and Aaron Hicks crushed an opposite field homer off of Aaron Loup to give the Yankees a 7-2 lead. Fun fact: Aaron Hicks is hitting .328/.418/.569 his last 16 games. The Yankees’ patience seems to be paying off. 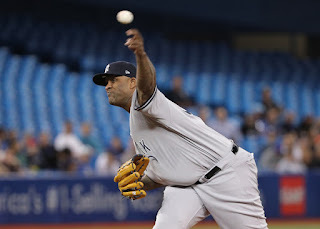 On the other side of the ball, CC Sabathia had everything going tonight. It wasn’t until the sixth inning that the Jays managed to even barrel anything up against him; Sabathia continued his reign as a soft contact king. Teoscar Hernandez lifted a solo homer just inside the left field foul pole in the sixth, and Kevin Pillar drilled a solo homer in the seventh. Other than those two mistakes, CC was lights out, allowing just one other hit to Solarte in the first inning, walking one, and striking out six. It was a welcome sign to see the big man return to his 2016-2017 form once again. David Robertson and Chasen Shreve closed out the final two innings of the game. The Yanks and Jays are back tomorrow for the final game of this quick two game set, with the pitching matchup being Sonny Gray opposing Sam Gaviglio.